Wellness WellBars Dog Treats are nutritious, crunchy snacks that use wholesome ingredients to provide a healthy snack that dogs love. These bite-size treats use only premium ingredients, meaning they don't include any corn, soy, or wheat that can be difficult for your dog to digest. They are also free of any artificial colors or flavors- using only natural, wholesome sources of nutrients. This package of Wellness WellBars Dog Treats comes with 50 ounces of treats in a Crunchy Peanuts & Honey flavor; however, there's also a 50-ounce package of Whitefish & Sweet Potatoes and 20 ounce packages of treats with Chicken & Cheddar Cheese and Lamb & Apples flavors. 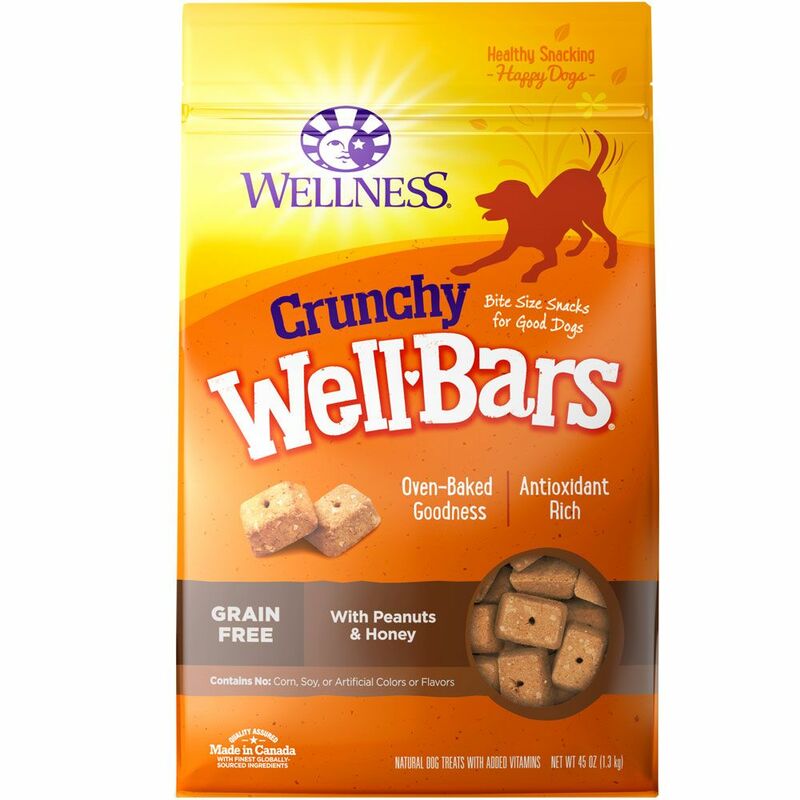 Your dog will go bananas over these delectable WellBars- so order now! Ingredients: Ground Barley, Cane Molasses, Ground Brown Rice, Natural Peanut Butter, Chicken Liver, Peanuts, Honey, Oatmeal, Flaxseed, Ascorbic Acid (Vitamin C), Vitamin E Supplement, Mixed Tocopherols added to preserve freshness, Beta-Carotene.